Eco Car Wash provides external hand wash and valeting services. 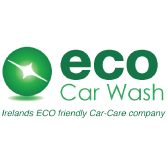 Have your car washed while you shop by Eco Car Washes expert valet team using the highest standard environmentally friendly products. Eco Car Wash uses natural solvents and as little as 3 litres of water to wash a car. Eco Car Wash also use rainwater capture where possible.